The lifestyle indulgences I go in for might seem quirky, I admit. In some ways I’m frugal: our cars are old, I usually upgrade my wardrobe only when actual holes in my clothing require it, and we’ll probably never update our very-1980’s kitchen. But other times, I splurge indiscriminately: finding myself in a new grocery bulk section last week, I bought a bag of every unfamiliar dried bean there. Yellow beans! Pink beans! Speckled beans! Tiny beans! And more, many more. I have only one source to blame for this new obsession: Rancho Gordo. A local shop carries their beans, which have opened my eyes to the wide world beyond black and white beans, familiar pintos and chickpeas. I have fallen down the dried-bean rabbit hole and I like it here. That charmer pictured above is Rancho Gordo’s Ojo de Cabra, a meaty beauty of a bean so succulent that I kept plucking them from the bubbling pot despite the peril to my fingertips. Like all beans, they’re even better the next day, and that’s when I suggest that you make this pasta. 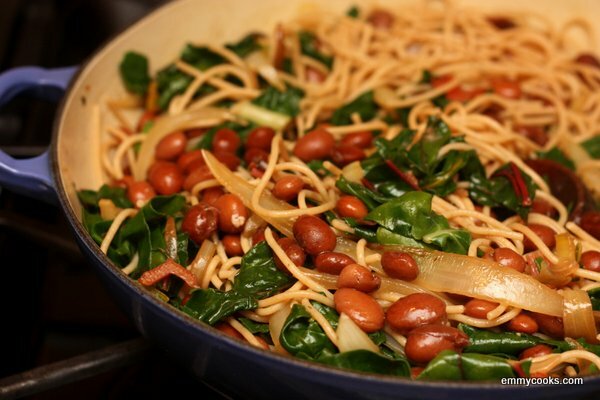 This dish is fine and dandy with drained canned white beans (maybe add a little chopped fresh rosemary in that case), but it is even better as a showcase for an excellent bean if you cook it yourself and use a few scoops of the bean broth to finish cooking your pasta. This entry was posted in Beans and Other Legumes, Food, Noodles, Recipes, Vegan or Would-Be-Just-As-Good-Vegan and tagged beans, greens, pasta, pesto, vegan, vegetarian on April 23, 2013 by emmycooks. There’s a new category of food in our house these days that I like to call “decadent vegan.” Regular vegan food, as everyone knows, is steamed quinoa with shredded carrots and a squeeze of lemon, but decadent vegan food is different. It’s this creamy, hearty pasta, and my first experiment with deep-frying and that addictive roasted squash salad that we’re still making every chance we get. In truth, a lot of recipes on this site fall into the decadent vegan category, but for some reason I hadn’t thought of them that way before. This year, I’m making a conscious effort to cook more vegan meals. Decadent, delicious vegan meals. What are your favorite recipes or ideas that fall into the decadent vegan category? Please share! 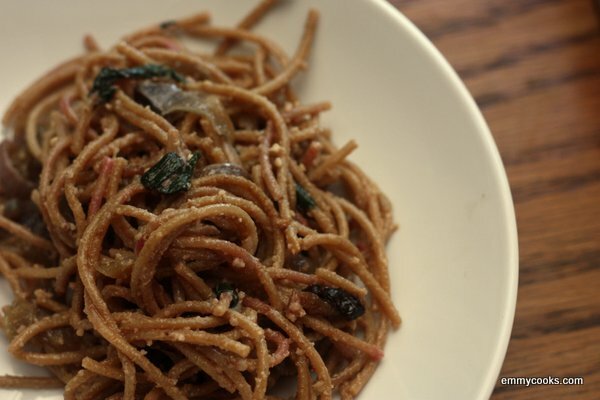 This entry was posted in Emmy Cooks Original, Food, Noodles, Recipes, Sauces, Vegan or Would-Be-Just-As-Good-Vegan and tagged caramelized onions, greens, onions, pasta, walnut oil, walnuts, whole grains, whole wheat pasta on January 17, 2013 by emmycooks. I know that peanut butter is considered kid food, but I’ve never quite grown out of it. It’s a great grab-and-go snack on apple slices or crackers. It’s equally at home in cookies and in oatmeal. And I’ve long considered the PB&J the ultimate travel food (yes, even before we had kids). So I’m wondering, why don’t I use it in my savory cooking more? 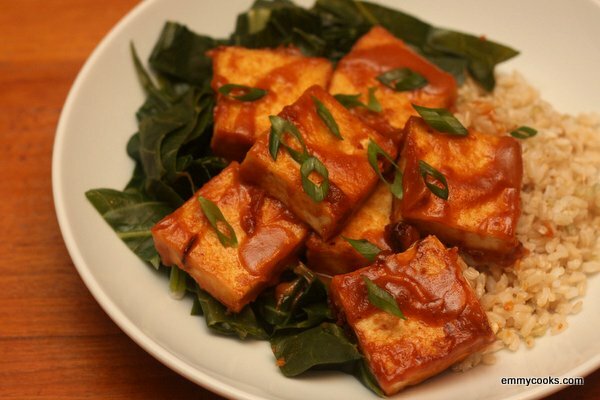 This entry was posted in Asian Flavors, Food, Recipes, Sauces, Tofu, Vegan or Would-Be-Just-As-Good-Vegan and tagged collard greens, greens, peanut butter, peanut sauce, peanuts, Sriracha, tofu on November 18, 2012 by emmycooks. Welcome to Emmy Cooks! You can see some of my favorite recent recipes by clicking the “My Favorite Recipes” category on the sidebar (here are July, August, and September). If you like what you see here, you can sign up on the sidebar to receive a daily recipe by email, add the RSS feed to your own reader, or follow Emmy Cooks on Facebook, Twitter, or Pinterest. 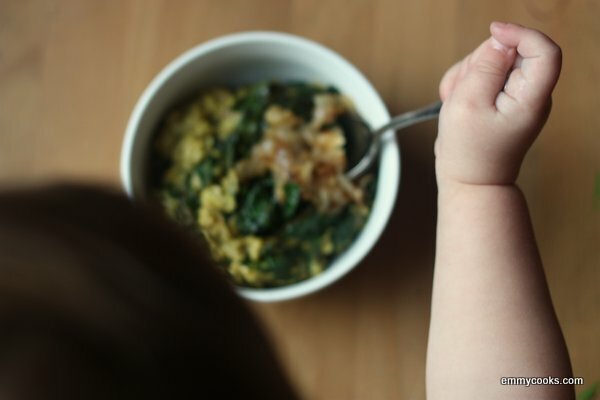 This entry was posted in Asian Flavors, Breakfast, Easily Multiplies to Feed a Crowd, Food, Grains, Recipes, Vegan or Would-Be-Just-As-Good-Vegan and tagged beet greens, caramelized onions, curry, greens, oats, onions on October 23, 2012 by emmycooks. Welcome to Emmy Cooks! You can see more of my favorite recent recipes by clicking the “My Favorite Recipes” category on the sidebar (here are July, August, and September). If you like what you see here, you can sign up on the sidebar to receive a daily recipe by email, add the RSS feed to your blog reader, or follow Emmy Cooks on Facebook, Twitter, or Pinterest. Some days, maybe most days, simpler is better. This entry was posted in Food, Recipes, Salads, Vegetables By Themselves and tagged beet greens, frisee, greens, radish tops, vegetarian sides and salads on October 5, 2012 by emmycooks. It’s a fact of life: sometimes things go wrong in the kitchen. Sometimes very wrong. No big deal, it happens. Those are the recipes (and there are many) I never tell you about here–except, of course, for when I do. (Ask me some other time about the all the dull things I’ve done with spinach, the watery attempts at Indian food, or those disgusting microwave potato chips.) But today, this is a story of redemption. 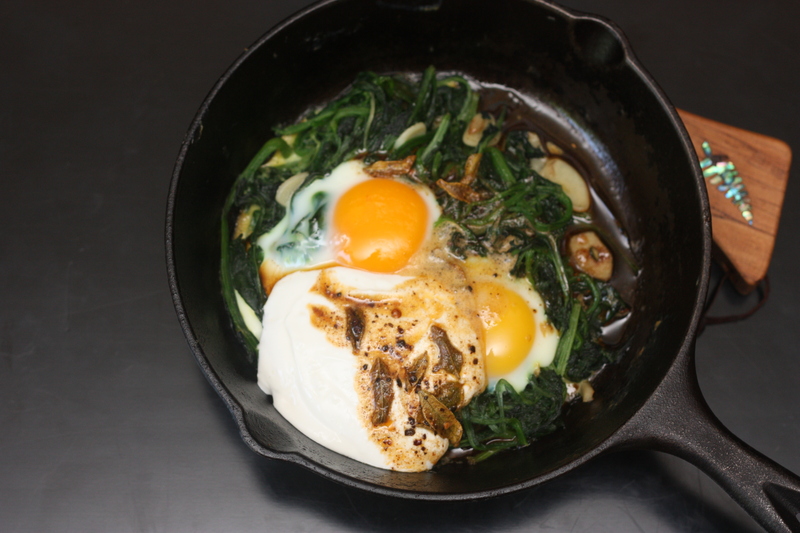 This entry was posted in Breakfast, Eggs, Food, My Favorite Recipes, Recipes and tagged breakfast, brunch, CSA recipes, eggs, greens, Ottolenghi, spices, yogurt on July 28, 2012 by emmycooks. 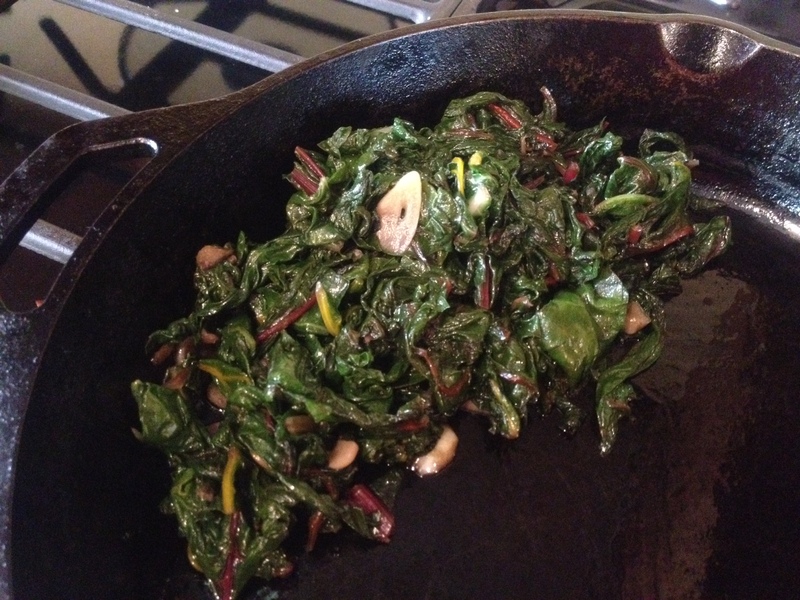 At this time of year, our veggie box is full of leaves, and this recipe is my go-to solution for cooking them down to a manageable size for storage or immediate consumption. 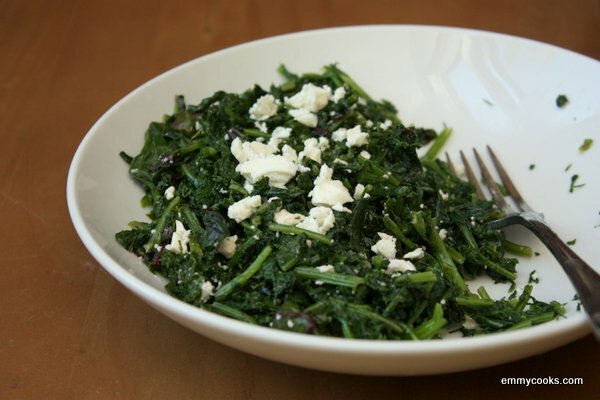 These silky greens are great alone or as a component of another dish (try whole wheat pasta with these greens and basil pesto). This entry was posted in Food, Recipes, Vegan or Would-Be-Just-As-Good-Vegan, Vegetables By Themselves and tagged arugula, beet greens, chard, garlic, greens, making vegetables smaller so you can eat more of them, summer CSA recipes on July 16, 2012 by emmycooks.